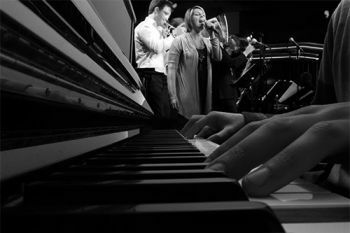 To mark the launch of the City Summer Sounds Festival, City's Big Band will be hosting a rat pack esq jazz night featuring several guest vocalists from the Centre for Music Studies. Tunes from likes of Count Basie, Buddy Rich, Gordon Goodwin, Bob Florence and other big band legends will also be a feature. City University Big Band was set up by music students in 2010. Since then they have enjoyed unfounded success, playing at numerous venues all over London including the prestigious Bull's Head jazz club - 5 times! Currently in its third year, the band has gone from strength to strength, attracting more and more musicians (including former students and even lecturers) and developing its impressive repertoire of classic and contemporary big band music.